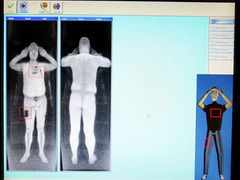 Airports introduce naked security scanners – the X-ray vision is cool, but privacy anyone? As if taking off your belt and having to empty out the contents of your handbag every time you go through airport security weren’t enough, Manchester airport has just introduced scanners that reveal your naked body to the security staff. Security authorities been trialling the electromagnetic scanners at Heathrow since 2004, and have decided that it’s a better alternative to the pat-down routine that is currently in place. Apparently travellers complain about getting patted down, and security officials think they’ll prefer these scanners that virtually undress them. “In a recent study, 19 out of 20 persons preferred a Secure 1000 scan to an invasive pat-down physical search” claims Rapiscan systems, the company behind these high-tech scanners, on their website. Um, is an “invasive pat-down physical search” the same as a normal pat-down physical search? How independent was this survey? Did the passengers know they were being projected naked onto a screen? I think I had the privilege of going through one of the test scanners at Heathrow a few years ago (correct me if what I’m describing is wrong) but from what I remember the experience was slightly weird. Yes there wasn’t someone tugging at your jeans, but it involved the usual taking your shoes and coat off, then standing in a plastic box with your hands behind your head like in a police raid, first facing one direction then the other. Great. Of course your body is one of the objects concealed under your clothing. Minor detail. Officials promise that each photo is only seen by one security officer and deleted immediately after being checked. Passengers who object to the naked scan can choose to go through the traditional pat-down instead. The speed of the imaging techniques is the breakthrough here – it’s impressive that the images are almost instantaneous creating the real-life equivalent of superman’s X-ray vision. Just a shame they infringe personal privacy like this. At least when you’re getting patted you can see the person patting you, but with a scan, it’s just you in a plastic box with your hands on your head. Fortunately with a £80,000 price tag on each scanner it’s not like the sort of thing that any pervy whippersnapper can set up in their front door. That is a great response. They do claim it’s safe: radiation from the scan is “equivalent to the exposure every person receives each five minutes from naturally occurring background environmental radioactivity” apparently. But i’m all up for protest stripping. I understand this scanner uses Xrays. X-rays are dangerous, so if ever I go through customs and am asked to go through the X-ray machine. I will respond with I would rather strip naked in front of everyone than be exposed to Xrays. If there is a medical reason making an X-ray necessary then fine, but in an airport. No thank you.